Function: As long as one innocent being is threatened, none are truly free. Profile: Charged with the awesome responsibility of protecting humans from Decepticon Attacks, Defensor views the people of Earth as if they were his own children. Using all his power and strength, he'll fight until his last drop of fuel is expended before he'll allow a person to be harmed. His is a kinship that defies logic; in fact, many of the other Autobots worry that Defensor undermines his own effectiveness by being so emotionally attached to humans. Inevitably, Defensor is disappointed by this cross species friendship he tries to foster. Although he thinks of himself as one of the humans much like a sheepdog among a flock of sheep, rarely do humans consider this hulking mechanical alien one of them. More likely they consider Defensor a threat, as terrifying as any Decepticon. So far, this s a bitter truth that Defensor refuses to accept. 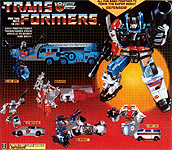 Abilities: Defensor has tremendous strength. He can lift 300,000 lbs. with one hand. As a combination of the 5 Protectobots, Defensor has a mind that is surprisingly sharp. Occassionally he suffers from the brief mental lapses when the portion of his mind that is Groove's wanders. He is impervious to most artillery. He can surround himself with a 50 foot circle around him with a protective force field. This however, takes tremendous energ, so Defensor rarely uses the force field for more than a minute at a time. He wields a fireball cannon, which shoots 2000 degree bursts of blue fire up to 1.5 miles. Weaknesses: Other than the aforemantioned brief mental lapses, Defensor's limbs sometimes fail to move upon command from his brain, apparently due to poor circuit connections. He is not especially mobile or agile.